I was commissioned to make cupcakes for a bridal shower. I was asked for chocolate with a chocolate frosting, and a white cupcake with strawberry frosting. I ordered purple foil liners, since that was the color for the wedding. For the chocolate cupcakes, I used one of my favorite chocolate cake recipes – one bowl chocolate cake with a chocolate mocha buttercream. I piped on the frosting with a 1M tip. I hand piped chocolate heart shapes and added a gold sugar pearl and purple sugar sprinkles on each heart. I may have added too many strawberries, so it was not as firm as it needed to be. I topped the strawberry frosting with white sparkling sugar sprinkles. In the future when using this strawberry frosting recipe, I’ll stick with the recommended amount of strawberries. And if I still find it won’t pipe on and hold it’s shape, I’ll probably add fresh strawberry garnish to improve the aesthetic appeal of the cupcakes. A friend commissioned me to make 60 cupcakes for her daughter’s baby shower. I had made cupcakes for her bridal shower two years earlier, and a gender “reveal” cake when her daughter became pregnant. The the mom-to-be again requested the fresh strawberry cupcakes with buttercream frosting for her baby shower. I told them I would make a cake as my gift to the bride. We decided on a lemon velvet cake with raspberry buttercream frosting. The theme of the shower included elephants and the colors pink and grey. The grandma-to-be purchased pink polka dot cupcake liners, elephant cupcake toppers in pink/grey and pink/grey zigzag, and other shapes, as well as a cake topper. Links included to show samples; I can’t vouch for the vendors since I do not know where grandma-to-be purchased them. The cupcakes were topped with a swirl of buttercream frosting. I then added pink and silver sugar pearls around the cupcake, and then topped them with the cupcake toppers that had been hot glued onto toothpicks. Then it was on to the cake. I will say that I tasted the batter before I cooked it. It didn’t taste real lemony to me, so I squeezed some fresh lemon juice into the batter, in addition to the lemon zest and the lemon extract. Around the base of the cake, I piped on bursts, and added a large white sugar pearl in the center of each burst. Finally, I spelled the baby’s name with raspberry buttercream piped on candy melt circles in bright white that I added some black color to in order to get a grey. Congrats Kaitlyn and Kevin – we can’t wait to meet baby Hannah! Photo courtesy of Lidia Miller Photography. 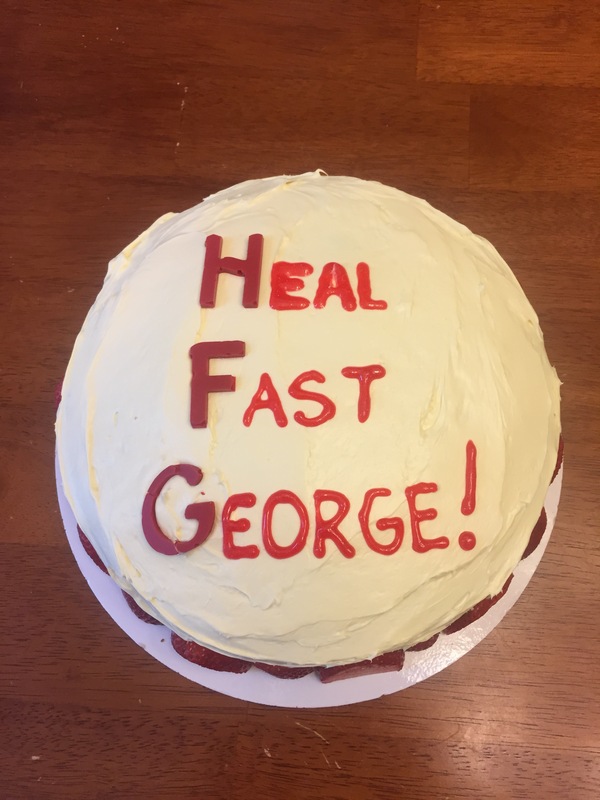 My friend Lou’s birthday is one day after my husband’s. He’s not a big party guy, but Lou is one of my party sisters. We love a good time, and liquor is the icing on the cupcake, so to speak. maybe it’s the fresh squeezed lime juice…maybe the lime zest. Whatever it is, this frosting is amazing! For the actual cupcake, I substitute any vegetable oil the mix requires with canola oil. I find that canola oil makes my cakes more moist and airy. I used a 1M star tip to frost the cupcakes. This makes just enough to frost 24 cupcakes, but I forgot that the recipe makes more than 24 cupcakes. In the future, I will double the frosting recipe to ensure better cupcake coverage. Leftover frosting could be used for something, I’m sure! Cheers and Happy Birthday, Lou! 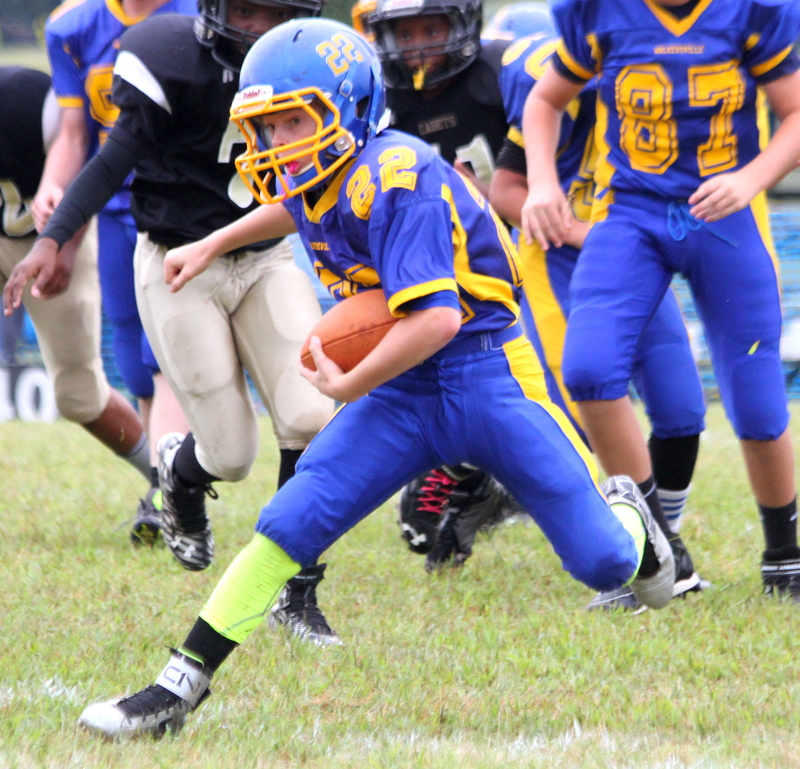 This has been an injury-plagued season for my younger son Nick’s junior football team. The starting running back got a concussion that has sidelined him for three weeks. 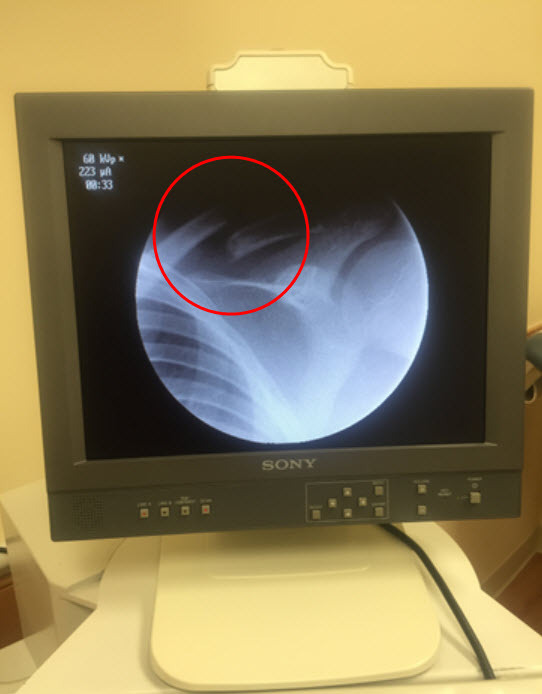 Those two bones at the top left…yeah, they’re supposed to be connected. 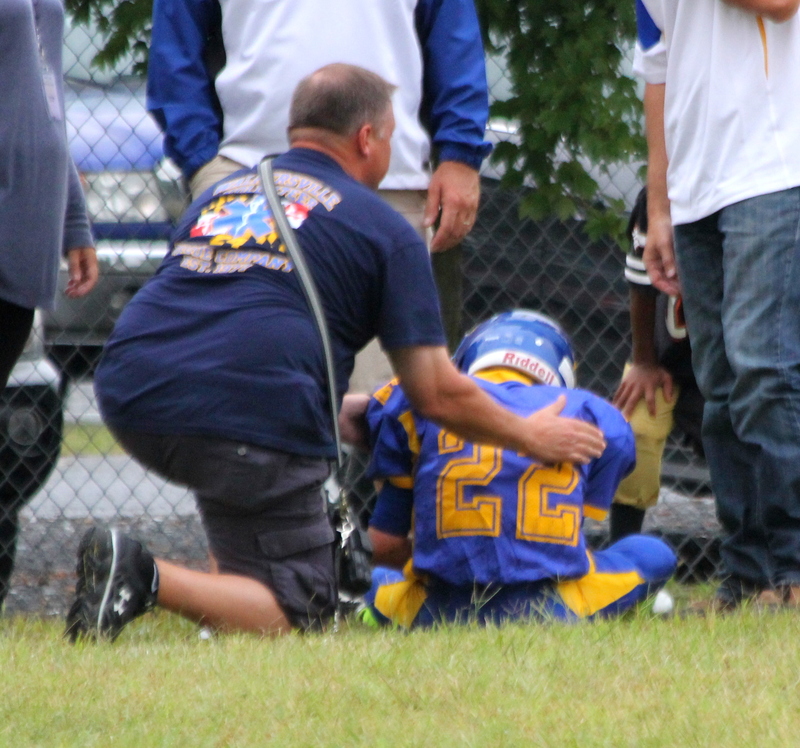 This is George being helped by a dad whose son plays on my older son’s team. This dad is on our local volunteer fire and rescue squad. He comes to every home game just in case he’s needed. 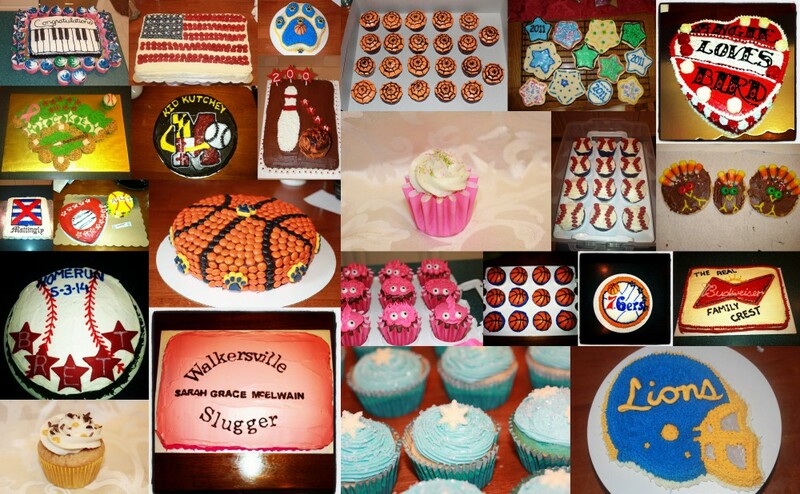 That’s why I bake him treats for every home game! 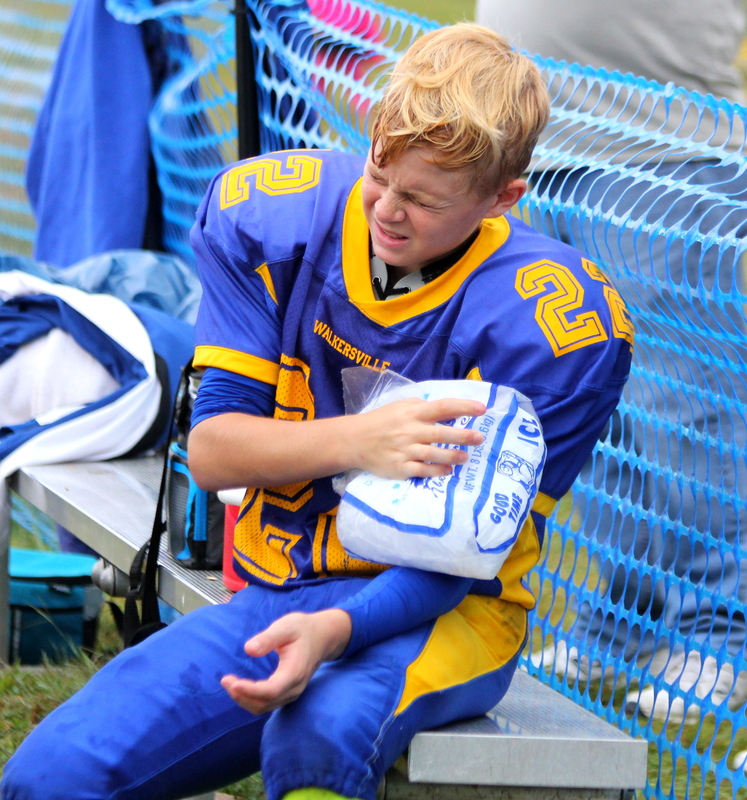 And here’s George on the bench – turns out it was his ulna that was broken. The next week I was finally able to get to that cake. I used a box French vanilla mix and can of vanilla frosting. 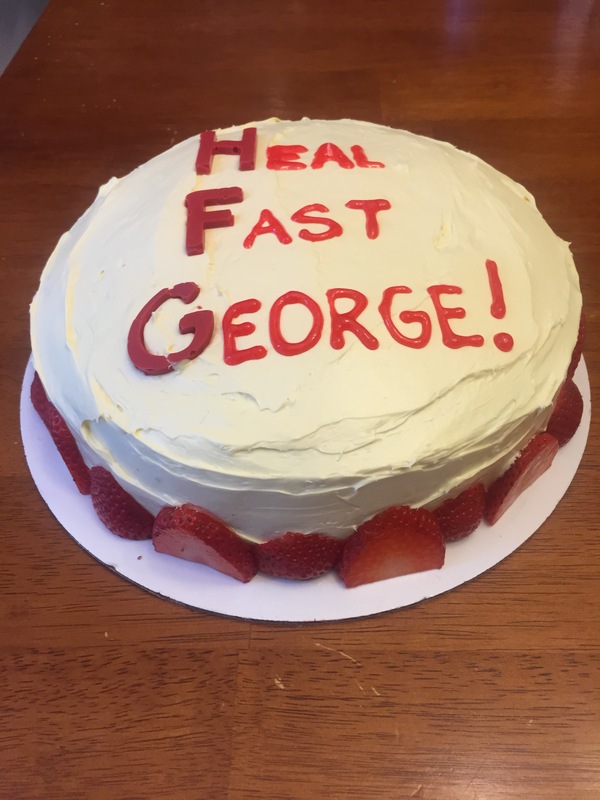 I also put a special message on the cake using candy mold letters and red sparkle gel frosting. I sliced fresh strawberries from top to bottom and placed them in an alternating up/down pattern along the bottom edge of the cake. 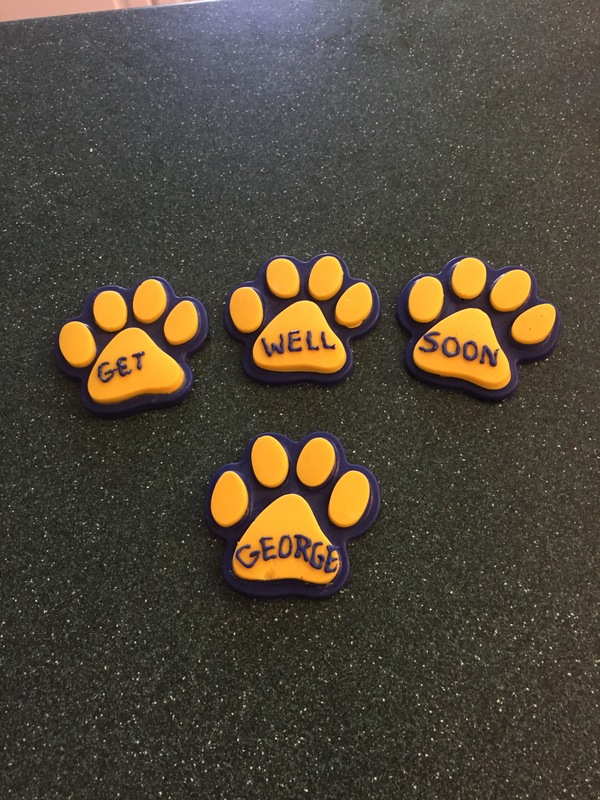 Get well soon George – we miss you on the field. Each year in the Summer, my cousins from moms side of the family get together for our annual “Cousins & Crabs” celebration. It’s a feast of steamed crabs, burgers, dogs, and endless side dishes with all the cousins (13 of us), our kids (13 of them), as well as our aunts and uncles. There are desserts, of course. This year, I made s’mores cookies, which I have made for other events, but not for my family. I also wanted to make a fruit-based concoction. I saw an inspiration photo on Facebook (alas, I couldn’t it again find it to show here), and decided to copy the concept. Mine wasn’t nearly as crisp and clean as the inspiration photo, but this is a fairly simple thing to make. I washed and dipped the strawberries in white chocolate melts. I probably didn’t dry off the strawberries enough, because the chocolate dipping process wasn’t as neat as it could have been. Water and the chocolate don’t mix well. You can see the chocolate globbed on in some spots, especially where the strawberries were not completely dry. Also, you really need a deep bowl to dip the strawberries in to get consistent coverage over the bottom half of the strawberries. I also worked to make sure the strawberries in each row were as consistent in size as I could get them. Dumping the washed blueberries in the upper left corner was the easiest part! 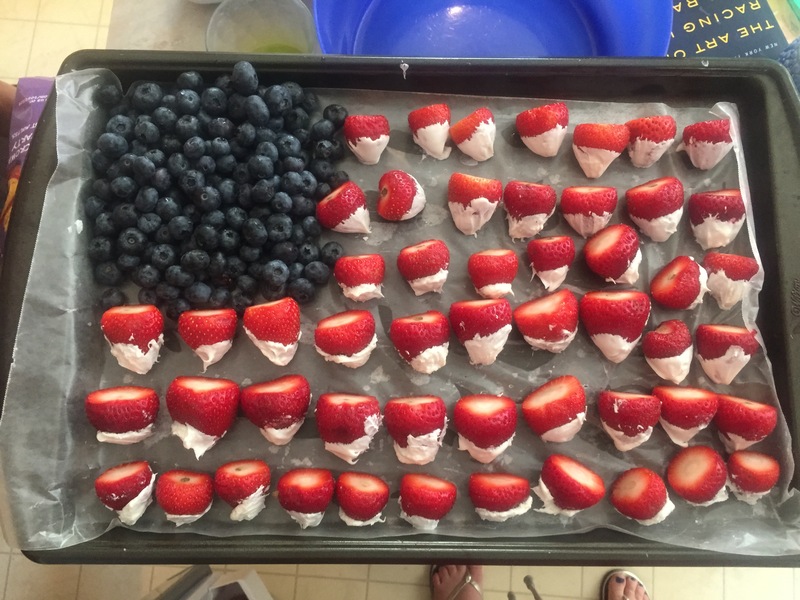 While not baked, and not my best looking effort, my family enjoyed fresh fruit with a little chocolate as a noshing option!